This is an update of the controversy over the presence of observatories on top of Mauna Kea. 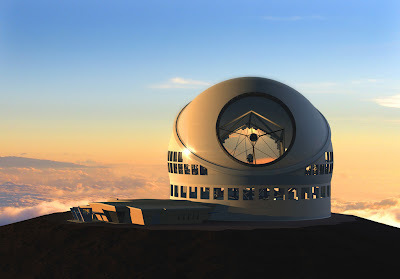 Yesterday, the University of Hawaii Board of Regents unanimously approved the plans for the construction of the Thirty Meter Telescope (TMT) - one of the largest planned telescopes for the next decade (it is expected to be operational by 2018). Some of the Native Hawaiian and environmentalist groups are unhappy about it and still plan to challenge the approval in the courts. The TMT now will now apply for a permit from the state, however, it is looking more and more likely that TMT will indeed be located on Mauna Kea. As an astronomer myself, I'm happy to see that this time astronomers have been more sensitive to the local concerns over Mauna Kea and I really hope that relations improve between scientists and those opposing the new telescope. Perhaps the key is for us to recognize that there is a real loss of a sacred space for some native Hawaiians and be mindful of the fact even when in disagreement about the future telescope. Here is the story from the Washington Post. In case you want to hear from the locals on both sides of the debate, here is a letter to the editor (on behalf of The Sierra Club?) in West Hawaii Today against the proposed telescope, and here is a letter in response in the same newspaper (also see this blog post: Is The Sierra Club Anti-Hawaiian?). As you can see this is a complicated issue with religion, politics, environmental concerns, economics, and US history in Hawaii, all mixed in together. While this case is different from the run-of-the-mill science & religion issues (such as evolution), it is still in the domain of science & religion. Instead of epistemology, the debate here is over identity. Tracy Leavelle (Creighton University) and I are close to finishing a paper on the topic, and I hope to provide you with an update on it soon. Mahalo nunui for talking about this issue. I believe The struggle over TMT on Mauna Kea's summit is fundamentally about power, control and money--who has a voice, and who doesn't. Opponents to TMT did not speak at the Board of Regents meeting, because we were not invited to speak. We did respectfully attend. Today, the University controls management of the entire summit area--they appoint ALL members of the "Office of Mauna Kea Management" and all members of cultural advisory group Kahu Ku Mauna. Community management means a diversity of members, proposed by community, selected by elected officials, or the like. This is clearly not the process we have in place today. In fact, the University has made great strides in acknowledging concerns over development on the mountain. Yet, nothing has fundamentally changed to the structure of management, the balance of power, or the outcomes. The University of Hawai'i was granted a $1/year lease on public lands for the construction of ONE telescope in 1968. Under that same lease, there are today over 20 telescope structures and support buildings on the summit of the mountain, representing millions of dollars in University patents and "viewing time. The University continues to call all the shots. With the construction of the TMT observatory, TMT headquarters, parking lot and new road, the astronomy park on Mauna Kea will nearly double in size. In this paradigm, what has really changed? In truth, this community has never had the opportunity to have a sane, pono, or reasonable conversation about the appropriate footprint of astronomy on Mauna Kea--and we all suffer for this today. Proponents and advocates for the mountain have for forty years simply asked for this opportunity. We continue to ask today.